the three year old awoke to a little easter egg hunt this morning. super fun for everyone and super easy for me to create for her, even at 10:30 last night. i bought these plastic eggs at spotlight and filled each one with a little chocolate egg and a simple drawing of where to find the next egg, with a big-ish egg and two little chicks as the grand finale. it was a total hit. 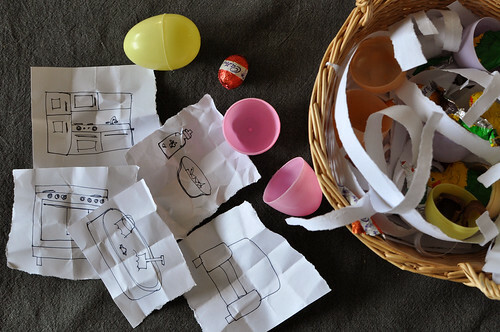 We have the same tradition in our house:) I just finished stuffing the series of clues inside the plastic eggs that lead my kids to their Easter baskets. We are in the United States, so my three little ones are still sound asleep in their beds waiting for Easter to arrive. Happy Easter! I like this tradition! It reminds me a bit of my childhood easter hunt... hope you're having a great Easter! Cutest ... family ... EVER!!! 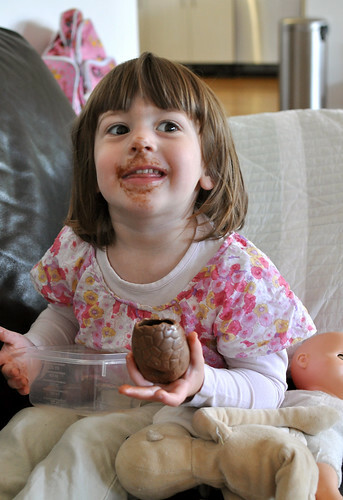 Happy Easter you guys, wish we could be there to hunt for eggs, too!